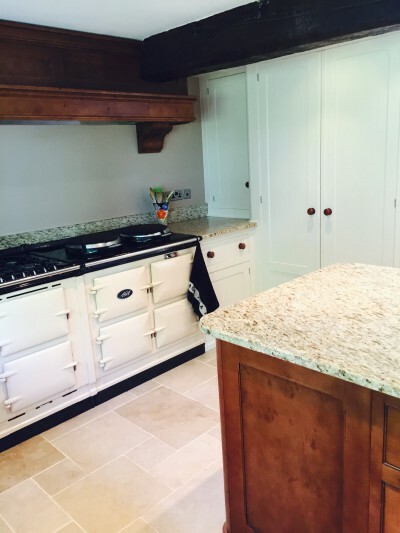 This beautiful Mark Wilkinson Furniture Cooks Kitchen is my latest Traditional Painter, Hand Painted Kitchen project. Being the Traditional Painter Member for the West Midlands, Ombersley, in Worcestershire, falls within my working area. 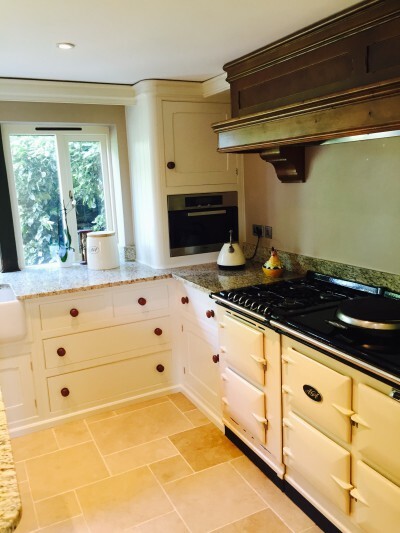 My clients contacted me after I completed a Hand Painted Kitchen project for their friends in Upton also in Worcestershire – personal recommendation is always a great way to receive an enquiry! 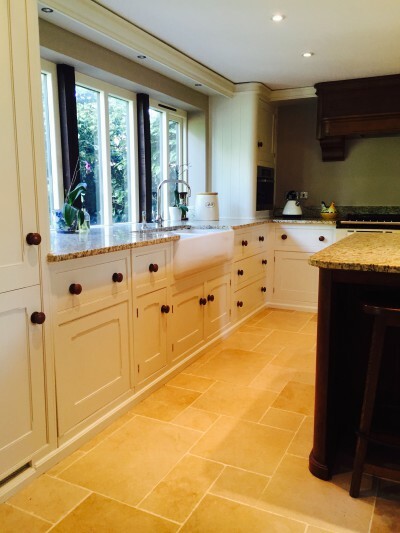 This particular Kitchen was around 9 years old and had been originally Hand Painted by the manufacturers. 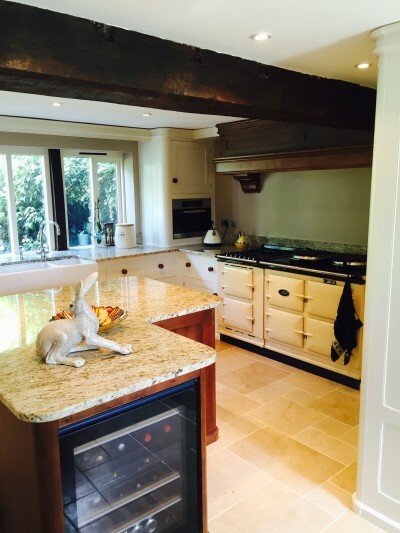 Although the basic build of the Kitchen was still as it should be, the paint finish was beginning to show the signs of general wear and tear and was in need of a refresh. The new colour was chosen – an equivalent to “Nantucket” – and away I went through my tried and tested system of “obsessive” degreasing and surface preparation with my Festool “dust-free” sanding kit. 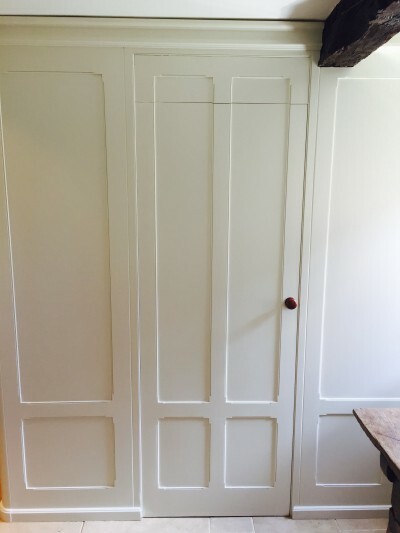 Tikkurila Otex, high adhesion primer was selected for the base coats, tinted to the same colour as the top coat in order to start building the depth of colour right from the start… followed by Tikkurila Feelings Furniture Paint (20% sheen) for the top coats. All supplied by Holman Specialist Paints. 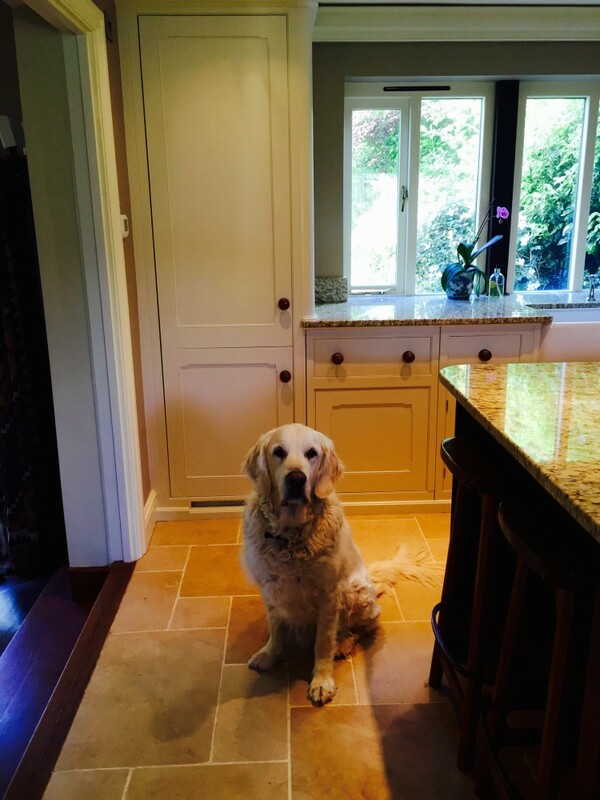 For further more information about my work and how I go about it, please visit my website; handpainted.kitchen Martin Guest, Traditional Painter for the West Midlands. 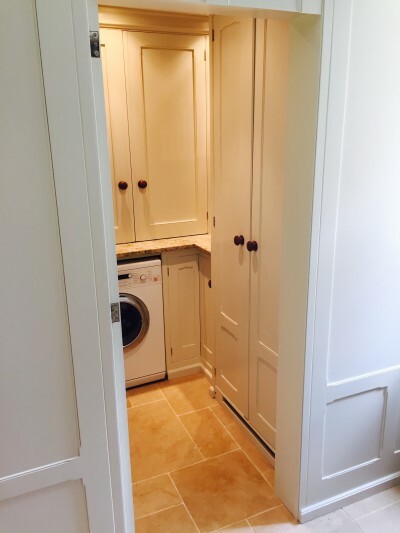 This entry was posted in Uncategorized and tagged Cooks Kitchen, Festool, Hand Painted Kitchen, Holman Specialist Paints, Mark Wilkinson Furniture, MWF, Nantucket, Ombersley, Repaint, Tikkurila, Tikkurila Feelings Furniture Paint, Tikkurila Otex, Traditional Painter, West Midlands, Worcester, Worcestershire on May 30, 2015 by mjguestltdblog.